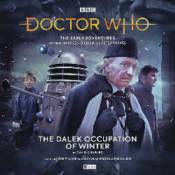 Starring Maureen O'Brien as Vicky, Peter Purves as Steven Taylor, and and Nicholas Briggs as The Daleks. The Early Adventures is a range designed to tell stories in long gone Doctor Who eras, with narration from some of the actors there at the time. Here Maureen O'Brien and Peter Purves reprise their 1964 roles as the first Doctor's assistants Vicky and Steven.